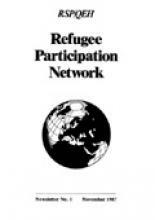 In 1987, the Refugee Studies Centre started publishing a small outreach newsletter called the Refugee Participation Network Newsletter (RPN). The proposal for a network and newsletter had emerged in a meeting of UNHCR staff and ICVA NGO representatives in 1985. The objective was to facilitate greater communication between researchers, refugees and all those individuals and organisations working for and with refugees. Barbara Harrell-Bond, founder of the Refugee Studies Centre (then, Refugee Studies Programme) at the University of Oxford, offered to establish and host both network and newsletter. She and the RSC’s Development Officer Belinda Allan raised the necessary funds and the first issue of the RPN was published in November 1987. That first issue was a 44-page A5 type-written black-and-white magazine, edited by Dr Maknun Gamaledin-Ashami, a research officer who also managed the Refugee Participation Network. By the mid to late ‘90s, the Network was less prominent and the RPN was a more professional style magazine in A4 format – even venturing into colour. It was increasingly publishing articles relating to internal displacement as well as refugees, and the old name seemed inadequate. After publishing 24 issues of the RPN, the publication was re-launched in 1998 as Forced Migration Review, using the term ‘forced migration’ that was at the time becoming recognised and more explicitly encompassing both refugees and internally displaced persons (IDPs). In light of the growing awareness of the plight of stateless people, FMR also started to publish articles on statelessness (including a full issue on the subject in 2009). In addition to full issues of the magazine, the FMR team has published several special issues (on the Indian Ocean tsunami and Iraq, for example) and a number of shorter supplements. All back issues are online. The FMR team continues to be committed to those original aims of bridging the communication gap between research and practice, and ensuring that the voices of displaced people are heard.